The Palestinian Prisoners’ Society (PPS) has reported, Monday, that the Israeli Prison Authority is still rejecting the legitimate demands of the Palestinian detainees, as nearly 400 detainees are ongoing with the hunger strike, and dozens more are expected to join soon. The PPS stated that the detainees negotiated with the administration in Ramon Israeli prison, but their demands remained ignored and denied, and added that another round of talks is expected later Monday. It also said that the outcome of the new round of talks will be the determining factor of whether the detainees expand their strike to include all prisons and detention camps. The detainees started the hunger strike eight days ago and were met with a series of punitive measures by the Israeli prison authority, which continues to deny their demands. There are currently nearly 400 detainees who are holding the hunger strike, dubbed as Dignity Strike 2, and are indirectly holding talks with the prison authority. 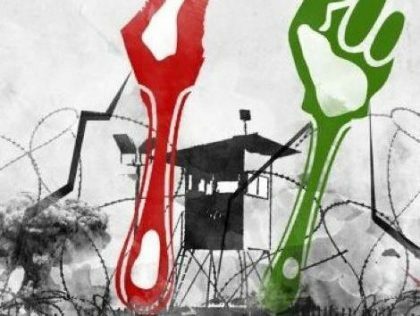 The detainees are in the Negev Detention Camp, Ramon Prison, Eshil, Ofar, Galboa’ and Majeddo, and the strike will likely expand to include all prisons. The PPS said the Egypt is involved in the talks to prevent further escalation; however, Israel has already started transferring and shuffling the detainees between its prisons and detention camps in an attempt to end their strike without listening to their demands. The detainees are demanding the Israeli Prison Authority to remove dozens of detainees from solitary confinement, in addition to refusing to remove signal jammers, refraining from providing an answer to the demands regarding installing public phones, and continues to deny Gaza Strip detainees the right to family visits. The detainees are complaining that the signal jammers are making them sick, as more detainees started facing health issues after their installation.